Welcome to the fourth Review Copy Cleanup! After three successful editions in 2012 and 2013, we’re back for another month of review copy reading madness. Whether you have a polite pile or a complete mountain of review books to get through, everyone is welcome to join. What is the Review Copy Cleanup? The RCC is a month-long event in which Vicky from Books, Biscuits & Tea and me (Nyx at Nyx Book Reviews) challenge ourselves to read as many review books as we can. We are both notorious for accepting way too many requests, and consequently our to be read piles are pretty daunting. 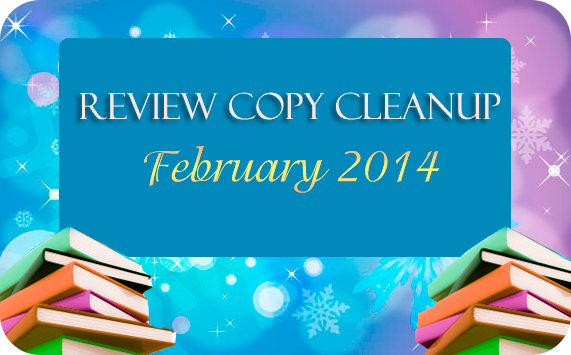 For some extra motivation to read, we invented the Review Copy Cleanup. This year we are keeping things simple – no challenges and just one scheduled chat, and weekly updates so we can all keep track of each other’s process. You’re welcome to keep track of the challenge in the way that’s most convenient for you. I might have to go longer than this month, I mean that's what my Project45 is about, no requesting or purchasing until I complete the ones I have to!! Well what's your list look like?? Share and I'll come commiserate with you.